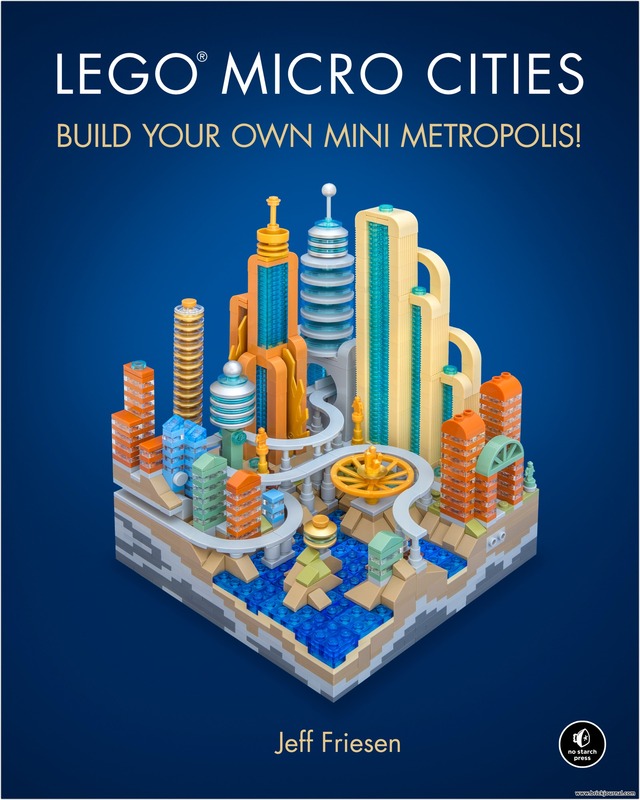 LEGO Micro Cities- Build Your Own Mini Metropolis! Micro scale building is one of the most challenging themes to build in. I often call micro scale LEGO origami, as both require being elegant with a part or a fold – nothing in either is wasted. One part in this scale usually has to convey what usually would take a few or more parts in a minifigure scale model. I love the theme for the challenge of building small, and LEGO MIcro Cities is a very good primer in building techniques for the cautious and beginners, and a really good inspiration for those who have some experience in building. The book is a good instructional book, as it starts with showing the reader how to find bricks on Bricklink and then building a base for a city. From there, the reader can build any one of eight types of city, from steampunk to modern to futurist. The last chapter show different details that can be added. Each chapter starts with a beauty shot of a city, and an introduction to building it. The next pages are instructions, but what makes this book so good is that it has places where the builder/reader can make their city their own. Optional builds and alternate parts are shown to show what can be built besides what is in the book. It allows and invites the builder to experiment, which is really nice. Also, parts are shown with their part number to make it easy to find on Bricklink. The second page of each section gives a little background to the city to be built and highlights what each city has – the builder gets a simple understanding of how adding bridges and rivers, among other things, adds to a city. These pages also bring the idea of storytelling to building – every city has a story that the builder creates, and every element has a reason to be in the city. This thought is something that isn’t addressed very often in building, and is an important factor to making large and small layouts. The instructions are photographic and, with the beauty shots of the cities and buildings, make for very colorful pages that are fun to look through and build from. Options for alternate building are presented at appropriate times – a builder can change the look of a building or add a bridge between two buildings if they choose. The narrative becomes one where an architect is showing what can be built and added to a builder for a city, and methods are shown elegantly and easily for making the city unique. The only whiny complaint (and it is whiny) is that the book form of LEGO Cities may take up too much room – the electronic version would be great on a tablet where a builder can zoom in and out at will on a step. LIke I said, that’s whiny. Outside of that, LEGO Micro Cities is a great addition to any LEGO fan’s library. From the photography to the building instructions, this book is a great introduction to micro building. For builders old and new, this is an instructional and inspirational book. It’s a perfect gift for any builder. ← Overwatch’s D.Va On Patrol at BlizzCon 2018!